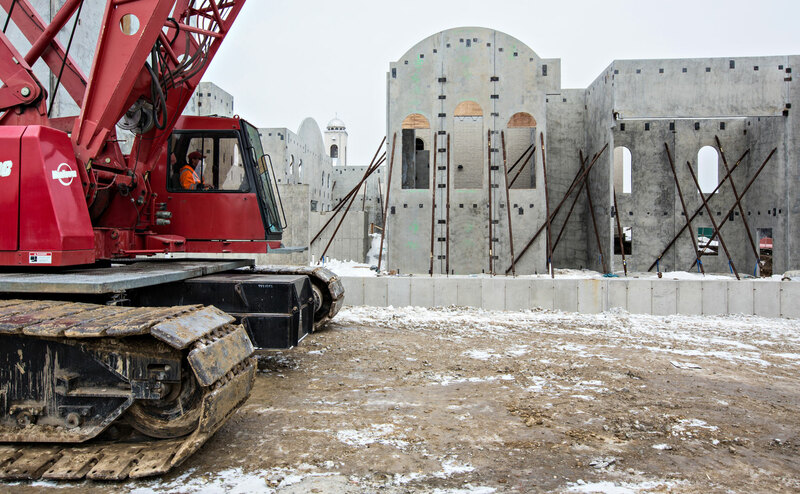 ST. MARK COPTIC ORTHODOX CHURCH OF CHICAGO BROKE GROUND ON THEIR BUILDING EXPANSION PROJECT IN DECEMBER OF 2014, RIGHT AT THE BEGINNING OF WINTER IN THE HEART OF THE MIDWEST. THEY CHOSE TO BUILD WITH TILT-UP CONCRETE CONSTRUCTION DUE TO THE TIME SAVINGS AFFORDED BY THE METHOD. In many parts of the country, winter construction presents serious challenges. Census Bureau data shows nonresidential winter construction spending from 2012 to 2014 averaged 33% less during January, February and March, when compared to July, August and September. Bitter cold, ice and blowing snow create hazardous work environments and can slow work on a jobsite where strict health and safety regulations must continue to be met. When weather conditions reach critical levels, operations unavoidably cease. The world, however, cannot stop for three months each year. For many owners, winter construction is necessary. Refaat Abid Abdel-Malek, Ph.D., P.E., F.ASCE serving as the owner’s representative for construction, explained that the St. Mark Coptic Othodox Church of Chicago, a congregation of the Coptic Orthodox Church of Alexandria (Egypt), has grown from a congregation of 120 families in the 1980s to over 500 families and continues to grow today. An expansion was necessary and the church was eager to get moving on a project. With an existing sanctuary that holds a maximum of 400 people, the church uses its gymnasium to accommodate a second service each Sunday. Worship is held from 8:30 AM to noon. With Sunday School and social activities held after worship, the services must be held simultaneously as there is not enough time for them to be held at different times. One service is offered in a combination of Arabic and Coptic languages and the other is offered in English. The expansion will add a new sanctuary with a capacity of 550, creating a more comfortable and appropriate worship space for one of the two services while freeing up the gymnasium for other activities. The church offers its space to the community when not in use and is incorporating added community space, as well as additional Sunday School space, into their expansion. 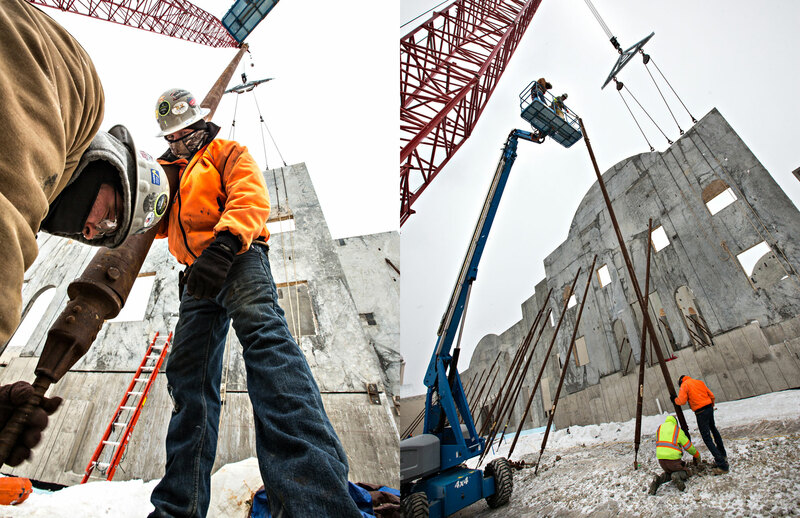 Tilt-up is highly documented as an effective method of construction in cold weather. “Much research in recent years has been devoted to demonstrating the effectiveness at maintaining strength gain in concrete despite cold and even freezing ambient temperatures,” said Jim Baty, Technical Director for the Tilt-Up Concrete Association (TCA). “With concrete panels easily attaining suitable design strength for lifting, the advantage quickly swings in the favor of tilt-up. Large sections of the wall enclosure are stood with a single crane operation where other assemblage systems require scaffolding and expensive tent-like enclosures to maintain temperatures suitable for working conditions and product performance.” A common myth surrounding tilt-up construction is that it is not suitable in cold weather. Not only is this not true – as evidenced by the large number of projects built throughout each year in Canada and other northern regions – tilt-up proved beneficial on this project in inclement weather. The speed of construction that tilt-up is recognized for becomes amplified during cold weather conditions where every day counts. “We presented an eight to ten week duration to convert the project to tilt-up and have it erected,” said Gebel. 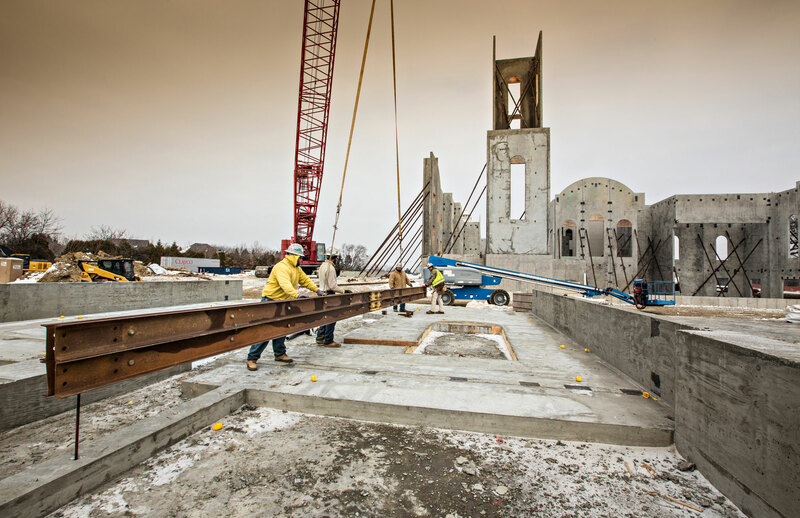 Concrete Strategies began forming panels in December 2014. The 46 load-bearing tilt-up panels were cast on three separate recyclable casting slabs surrounding the building footprint. Due to site restrictions, the panels had to be cast in two sequences. The first sequence of panels was erected from January 12-20, 2015. “Once the first series of panels is erected, tilt-up moves off of the critical path,” said Gebel. As is typical with tilt-up, other trades are able to jump in quickly and begin their work while subsequent panel sequences are executed. 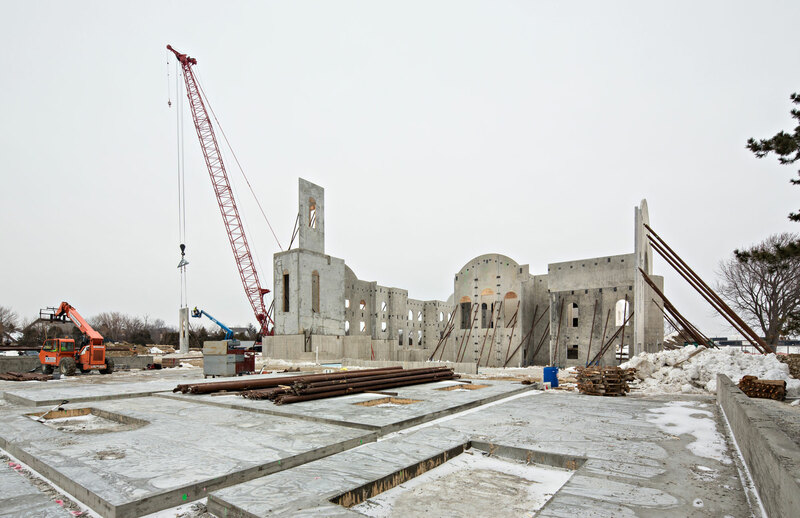 The day before concrete was scheduled for the second sequence of panels, the job site was hit with eighteen inches of snow and more frigid temperatures. According to the Chicago Tribune, the Second City spent February setting records for cold and snow. The National Weather Service reported February’s average temperature of 14.6 degrees tied a record for the month set in 1875. The normal average temperature for February in Chicago, according to the Weather Service, is 27.7 degrees. To add insult to injury, February 2015 will also go down in the record books as the third-snowiest February with just under 27 inches recorded at O’Hare International Airport, less than an inch shy of the second snowiest, February 1896. While the snow presented a challenge, the cold was brutal. “We worked in actual temperatures as cold as -6 degrees,” said Gebel. 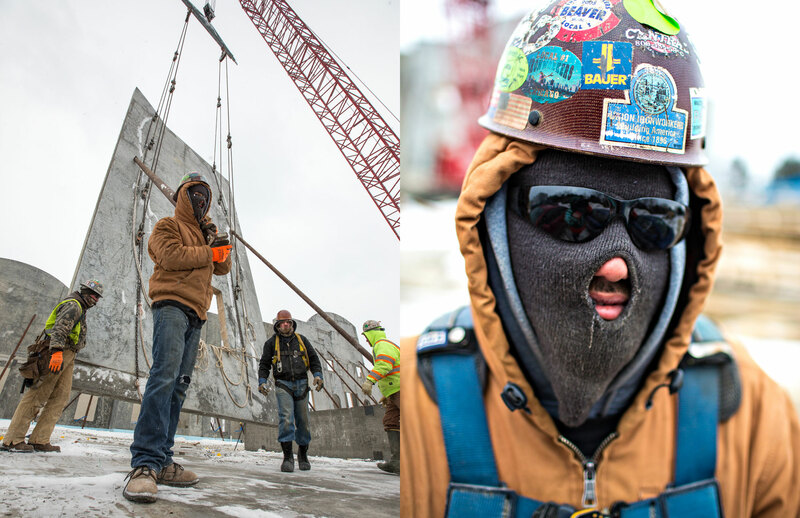 “Workers were required to cover all exposed skin to prevent frost bite and take at least four 15-minute breaks throughout the day to warm up.” Special attention had to be paid to the equipment as well. “All of the equipment we used was diesel powered. We left it running throughout the day and plugged it in overnight to keep the engine blocks warm.” Extra care was also taken to ensure safe working conditions onsite. Snow was completely cleared from work areas and sand was spread over icy conditions to prevent slip hazards. 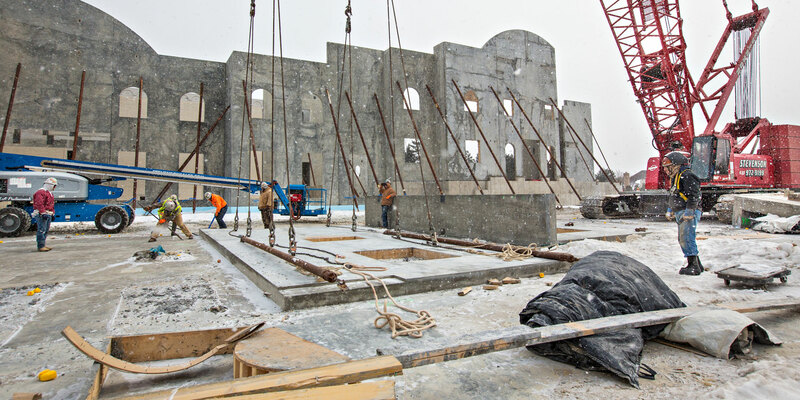 Erecting panels at temperatures below freezing presented some challenges, but Concrete Strategies had solutions. Crews used propane torches to clear ice from foundations, allowing for the placement of panels, and filled lifting inserts with RV antifreeze to keep them free of ice and snow. Panels frozen to the casting slab were broken free using wedges and baring. The final panels making up an impressive tower were erected on February 23, 2015. 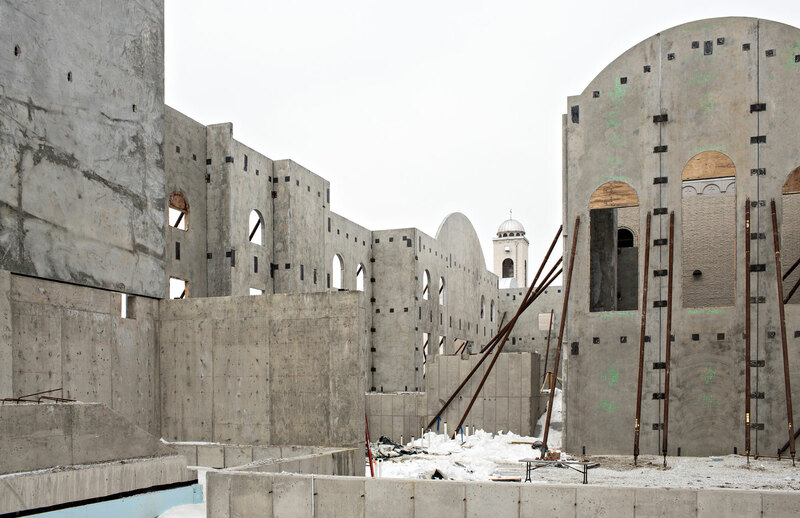 “We have become accustomed to expecting unique panels with churches,” said Scott Collins, PE, Engineering Manager for Tampa, Florida-based Meadow Burke, the company that engineered and supplied the concrete lifting systems and accessories. “One of the nice things about working with Concrete Strategies is that they take full consideration of our recommendations on panel joint layouts for better overall panel erection efficiency,” Collins said. Many of the panels on the job have special features to compliment the architecture of the original structure. The existing St. Mark Coptic Orthodox Church was built in 1981 and was completed in 1983. The building, located just off historic Route 66 in Burr Ridge, Illinois, an affluent suburb of Chicago, in Cook and DuPage counties, is faced with brick and stone. In addition to matching the materiality of the existing structure, the massing of the addition is also sensitive to the original building. Panels are offset forward and backwards to break down the mass of the structure. At most of these instances, the panels were cast with integral return legs eliminating the need for small panels to bridge out-of-plane gaps in the perimeter. While the returns added complexity to the lifting design, they saved time and money during erection. On the front of the structure, tall, slender arched openings provide contrast to the monolithic façade of the original building while monumental arched faces tie the new and old together. The tops of multiple adjacent panels are curved to form the large arched façades. Curvilinear forms presented themselves in plan as well as elevation. Curved (true radius) panels were cast on structures made of dimensional lumber and plywood constructed on the casting slabs. Numerous irregularly shaped panels didn’t leave much room for standard lift designs. “This forced us to come up with some creative insert patterns that I’m sure had a few guys in the field scratching their heads,” said Collins. Perhaps the most difficult panel on the job, according to Antholz, ended up being two panels on the south elevation. “As originally conceived, the 58-ft-tall, 40-ft-wide panel had a single 37-ft-wide opening at the base,” said Antholz. “On its own, that is a difficult panel to design, but the added complication of the supported loads meant that the architecture had to be modified slightly.” The panel supports the main level of the sanctuary on the inside, which is composed of hollow core precast planks with a concrete topping, and a masonry veneer of the outside. “A 30 in by 18 in concrete column element, integrally cast into the panel, was added to support the heavy loads,” explained Antholz. “Thickened return legs at the edges of the panel were similarly analyzed as concrete column elements in order to accommodate loading higher than is allowed using the slender wall procedures of ACI 318 Ch. 14.” As the panel would have weighed nearly 200,000 lbs., the decision was made to split it in two. With the exterior of the building being clad in brick and stone, the panels were cast with the inside face of the panel down. “From a drafting standpoint, this created a challenge to make sure you were using the right orientation,” said Antholz. Typically, the outside face of the panel is cast face down as the casting slab provides the best surface finish. Casting the panels this way allowed the crew to place steel embeds right on the slab instead of having to hang them from the formwork or steel reinforcement. The fact that the panels would never be exposed also aided in the placement of bracing hardware. According to Collins, the majority of the braces for the panels were anchored to Meadow Burke’s Badgers—a helical ground anchor system. 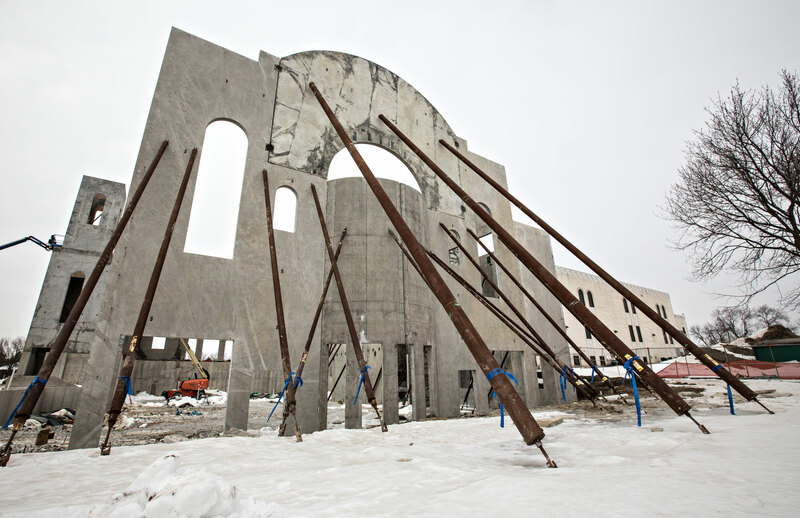 Installed to the outside of the building, these anchors and braces leave the inside of the building open for the erection of structural steel. With 2 ft of frost present, the helical anchors could not be installed as they normally would be. Concrete Strategies used a 6-in auger bit to pre-drill holes for the anchors. While many aspects of this project’s construction could be considered abnormal when compared to the typical tilt-up project, the takeaway is that the construction method is flexible enough to accommodate some of the most difficult design and construction challenges. Tilt-up allowed for a project to move forward when other methods of construction were too slow or too limiting. Concrete Strategies employs over 350 field personnel and completes over $100,000,000 in revenue annually, from its home office in St. Louis, Missouri. The company has an awesome reputation for speed, quality and, above all, operations, with a complete commitment to safety. For the last 10 years, Concrete Strategies has been one of the nation’s largest providers of tilt-up concrete services, completing projects in over 43 states. With 12 Tilt-Up Concrete Association (TCA) Achievement Awards, Concrete Strategies is continually recognized by top engineering and design firms for quality and consistently introduces innovative architectural and cost-saving measures to tilt-up projects. The experienced design and operations team has even converted projects from cast-in-place to tilt-up in order to save the client cost and time while ensuring safety and quality finishes. Founded in 2002, the St. Louis Office of KPFF provides civil and structural engineering to the design and construction industry. 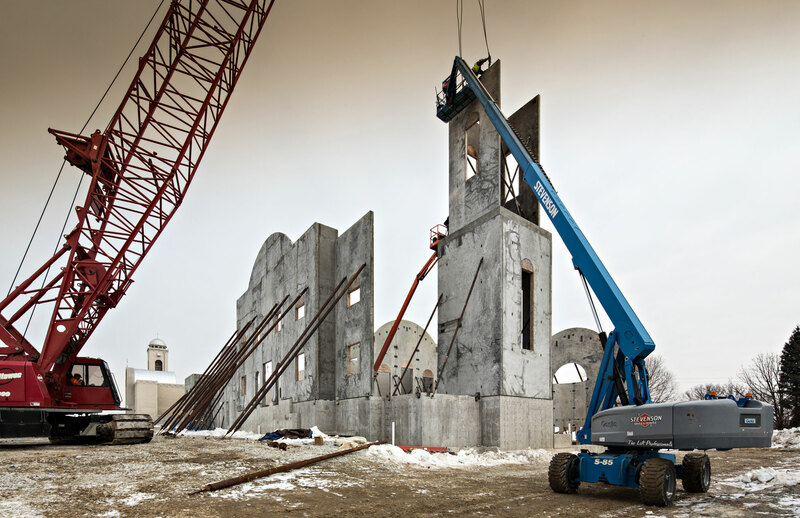 Their engineers have decades of experience in designing tilt-up panel structures for all types of building including warehouses, schools, industrial buildings, and churches. In addition to their work in the tilt-up industry, KPFF St. Louis provides a wide range of engineering expertise for all types of buildings throughout the Unites States, applying their broad-based experience to solve the most difficult and challenging problems.